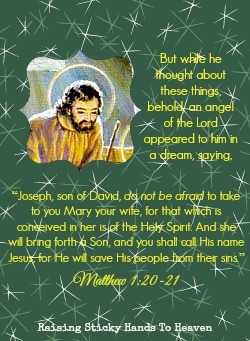 Can you even imagine what was going through Joseph’s mind and heart when he found out that Mary was expecting? What about when he realized that the baby she was carrying in her womb was the Son of God? He had to be terrified, and that is confirmed by the angel coming to him to say “do not be afraid”. Often, when God calls us to do something, we can become afraid as well. While what we are doing may never compare to marrying a woman who others believe to have done something she did not do and raising The Savior of the world from an infant into a man, it can still leave us feeling overwhelmed and scared. We forget what we know to be true: that God has it all under control. We stress over things like logistics, money, what others may think, and more. But what we need to remember is what Joseph is proof of: If it is the will of God, and we stay on His course, everything will work out. The second that we let our flesh try to detour His plans, by negotiating our ideas in, that is the very moment that things start to go wrong. What if Joseph had said, “I will marry her, but we will not keep the child.” I doubt that any of our lives would be where they are today. It is because Joseph did as he was instructed without fear that Jesus was able to thrive, grow, and eventually save the world. He trusted God and stuck to the plan. When God calls you, remember Joseph and do not be afraid.